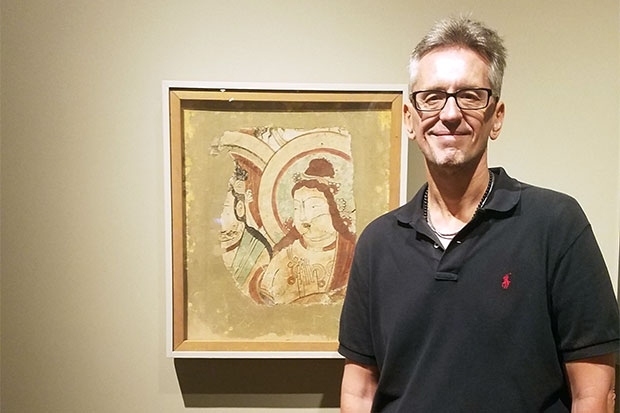 Having spent the last ten years as the museum’s curator of Asian art, Shawn Eichman’s knowledge of the Asian collection is intimate and encyclopedic. When asked to share his favorite museum artwork, how could he pick just one? Eichman, who specializes in East Asian culture—he is fluent in Japanese and Mandarin and holds degrees in Chinese studies and East Asian Philosophy, as well as a PhD in Chinese literature—recently returned from a two-month trip to China. When he asked to meet me in the Pan-Asian Buddhism Gallery and headed to a mural fragment against the north wall near the door, it was clear the journey inspired his “staff pick.” The work is called Bodhisattva. Dating back to China’s Tang dynasty, circa 8th century, the fragment depicts a round-cheeked bodhisattva, or someone who could follow in Buddha’s footsteps to enlightenment but chooses to remain earthbound to help others find salvation, in earthy burnt sienna and turquoise. Bodhisattva joined the museum’s permanent collection in 1951. It was purchased from a relative of Albert von Le Coq, a famous German archaeologist and explorer who led several expeditions to Central Asia and China in the early 1900s to collect artifacts for the Ethnological Museum in Berlin. The Ethnological Museum had built 13 additional rooms for the new Turpan Collection, and the murals retrieved on Le Coq’s expeditions filled all of them. Unfortunately, “The story of how they made their way all the way to Europe has a very sad ending,” says Eichman. Many of them were destroyed in 1945 when Allied bombs destroyed the museum’s northwest wing. Today most of those works exist only in black and white photographs. We are fortunate to have a fragment of the story right here in Honolulu. I can’t celebrate the thieft of treasure from the caves where they stood for centuries undamaged. Pictures of contents of the caves should be sufficient. I think museums are starting to think about stolen treasures. Thank you for your comment. You are correct—museums are thinking about stolen treasures, and the Honolulu Museum of Art is a leader in returning artwork with murky provenance. The museum follows the UNESCO Convention on the Means of Prohibiting and Preventing the Illicit Import, Export and Transfer of Ownership of Cultural Property of 1970. The sad thing is that so many of those cave paintings were desecrated and the faces were all hacked and scratched away when a new religion of believers swept through and intentionally destroyed what they found offensive. (They believe that the depiction of all humans and non-human animals is discouraged in the hadith and by the long tradition of Islamic authorities. Wikipedia) Having seen the destruction of these cave paintings first hand, I believe it is fortuitous that some museums still have examples of these extraordinary early Buddhist paintings. Few inviolate caves have survived and once the paintings were destroyed, the museums offered a safe place where undamaged artifacts could be seen, studied, and preserved for posterity. Museums have a long history of cherishing and protecting what often cannot be protected do to human and natural forces.